Sound system manufacturer Harman has unveiled a new incarnation of its Harman Kardon Soundsticks Wireless at the IFA tech and gadget show in Berlin. 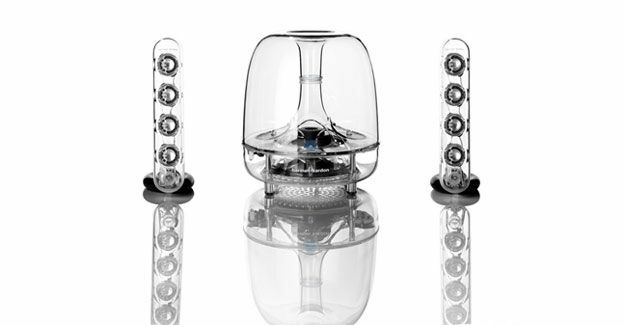 The Harman Kardon Soundsticks Wireless allows owners to stream audio from their Bluetooth-enabled devices while in the room or roaming around their house. The set boasts a six-inch subwoofer, eight full-range drivers, 40 watts of amplification and built-in Bluetooth technology. Alongside the new Harman Kardon Soundsticks Wireless, Harman revealed three state-of-the-art JBL soundbars ranging from 32 inches to more than 46 inches. The JBL Cinema SB 100, SB 200 and SB 400 offer high-quality audio through proprietary signal processing software that simulates a surround-sound environment. Prices start at £169 and go all the way up to £399. Harman also unveiled the AKG K551 headphones, which offer a combination of AKG reference class sound quality packaged with cushioned ear cups that feature 2 inch drivers in a full over-ear design. The new headphones will be available from October for a suggested retail price of £229.99.